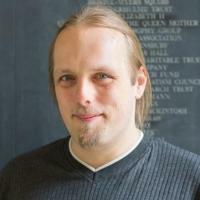 On this day in 2011 I launched FreeDeedPoll.org.uk, a site that tries to make it as easy as possible for British citizens to change their names (and have those new names accepted as being legally-recognised). 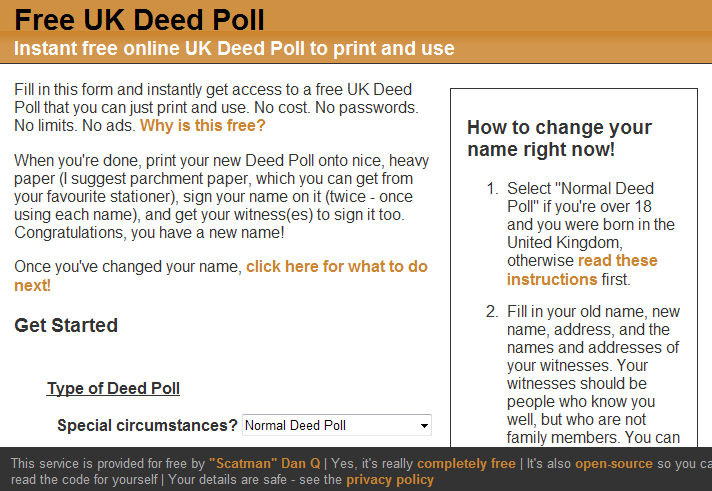 Generate free UK deeds of name change at freedeedpoll.org.uk. The thing that people often don’t realise is that, as a British citizen, you have the right to be known by pretty-much any name you like. You don’t need a solicitor to change your name. You don’t even need any money. You can just start using it. 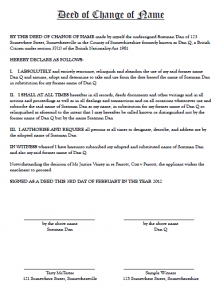 A deed poll, which you can make all by yourself for free, is just a piece of paper on which you write a promise that you consider your “new” name to be your primary moniker, and not your “old” one. Over the last year, almost 3,000 deed polls have been generated using the site, including ones for my partner Ruth (who opted to keep her maiden name as a middle name after she got married) and my friend Jen (who now has among the coolest – and most hippyish – collection of names I’ve ever seen). As to how many of the other thousands of deed polls have actually been used, I simply don’t know: as a commitment to privacy, no logs are kept of the names people enter onto the form, so for all I know there are 2,000 all the same and 998 “blank” submissions. I’ve become a minor Internet guru on the topic of name changes, it turns out. The other week, a transgendered stranger contacted me via the “chat to Dan” link, to ask about the legal aspects of their (slightly more-complex than most) case for changing their name. And because I’m a fan of helping people, I did a little research with them in order to find the answers. I felt the need to keep stressing that IANAL, but I’m pretty sure I managed to help, anyway. And over the New Year, when there were a few days of downtime for the site (I was part of an exodus of domains from my SOPA-supporing previous registrar, and they made the process difficult), I received messages from people asking when it would be back up again, so it’s obviously getting some use. Most recently, a few days ago, a stranger emailed me asking for advice on the legal issues in changing the names of his children. After doing the necessary research, I’m now thinking of expanding the site to make this easier, too. 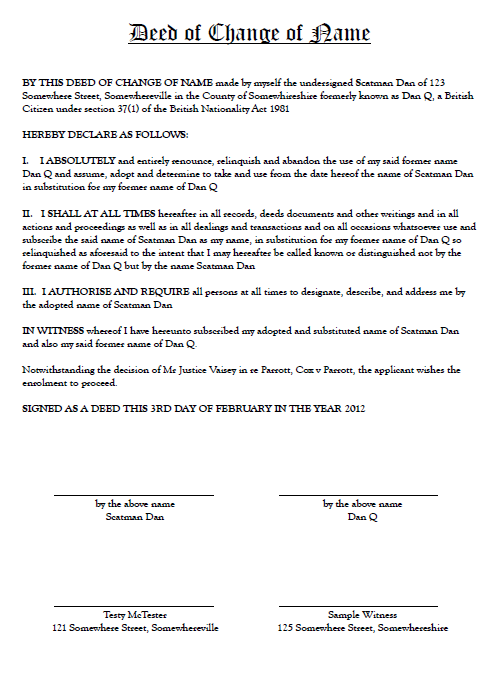 A (sample) deed poll document generated by freedeedpoll.org.uk. A strange feeling for me has been that this project is, and has been for the last year, “finished”. I’m not very good at finishing technical projects: one of the biggest and most important things that I’ve worked on – Three Rings – is now in its tenth year and shows no sign of being “finished”. So it feels odd to have developed a website that’s complete, done and dusted, and probably won’t require more than a modicum of maintenance over the coming decades to keep it running. It’s good, though, that I’ve been able to help people with something about which far too many are underinformed. It gives me a warm fuzzy feeling, and I like it. To mark the ocassion, I’ve updated the open-source version of the tool so that it works “out of the box”: it now includes all of the (free) fonts you need to get started, and can be used without setting up reCAPTCHA if you like. For more information about the history of the project, see my project page about it. My daughter is one of the many people who’ve benefited from your site. I gave her the link last year.